Submitted by HS on Tue, 2017-10-17 08:27. Submitted by HS on Tue, 2017-10-17 08:24. 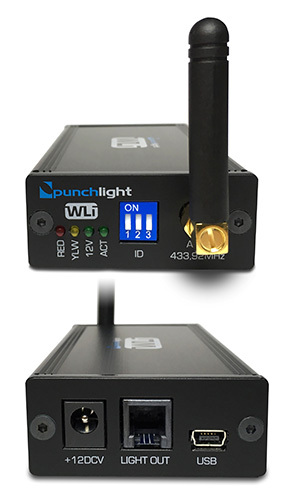 PunchLight WLi is a unique product which uses wireless technology to connect your computer to studio warning lights. It allows the of use of previously installed PunchLight lights and the expansion of the light system without cables - it can also connect to one external light via 12v output. 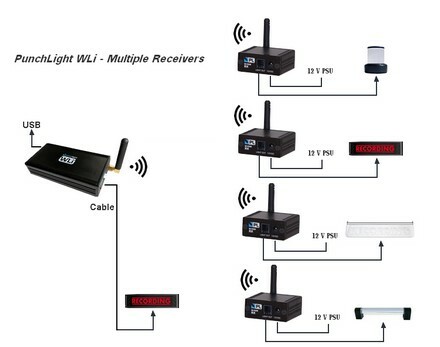 The WLi connects to your computer via USB and transmits to each light currently via our W-CON RX receiver/s. Theoretically, you can control an unlimited number of wireless lights with one PunchLight WLi unit. In the case of multiple light systems (ie multiple computers), each PunchLight WLi can be set to its own ID and work independently. The PunchLight WLi works at 433,92 MHz, and has sufficient range in most studio environments. Submitted by HS on Tue, 2017-10-17 08:25. Submitted by PK on Thu, 2018-10-18 12:59.